The Donkey has ploughed a straight furrow and generally assisted man for many centuries. However, there is little demand for such skills in the developed world in the 21st century and most are now considered recreational rather than working skills. 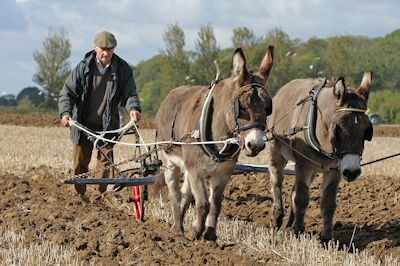 Agricultural equipment for donkeys is either of such an age as to be considered antique and collectible, or needs to be specialist made, but a trawl through the internet may prove advantageous. Harness must be well fitting to avoid rubbing and maintained carefully to ensure stitching and buckles are secure. Implements must be scaled to fit the donkey, so that they are not overpowered by the weight or size. 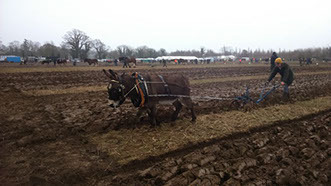 Ploughing matches are a familiar sight in many farming communities, although it would be fair to say that the John Deere tractor is more likely to take centre stage than the humble donkey. 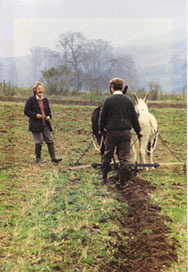 However the skills of the heavy horse and his ploughman are often to be seen alongside modern and historic tractors, and with them pairs of donkeys. 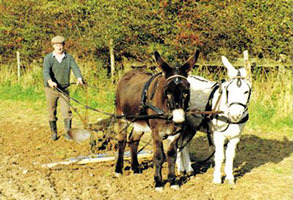 Donkeys and Agricultural implements are often central to the attraction of historic working museums such as the Weald and Downland Museum, Singleton, West Sussex and the Ulster Folk and Transport Museum, Cultra in Belfast, where donkeys are used to demonstrate the art of historic cultivation of small enclosures.